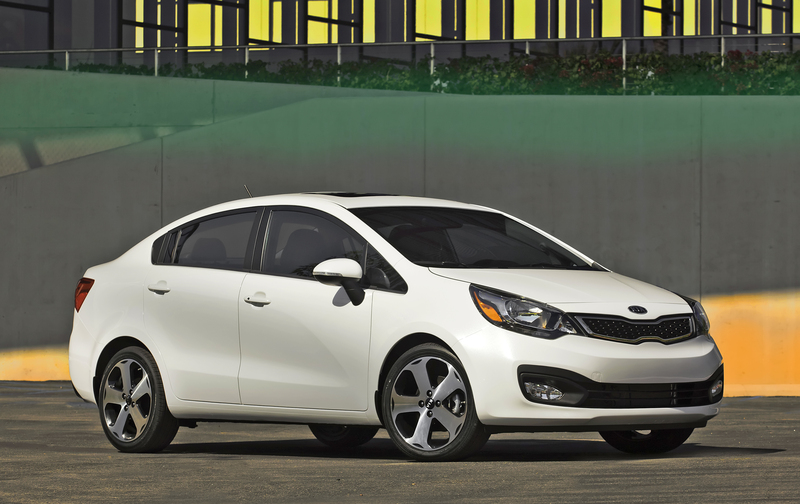 Kia’s 2013 Rio SX sedan – loaded. You’re no doubt familiar with the phrase, “Good things come in small packages.” When we talk about small cars, specifically the 2013 Kia Rio SX sedan, just about any one out there can have something positive to say about this stylish 4-door vehicle. While it is classified as a compact automobile, the interior space may well surprise. OK, so you will not be holding any parties in the back seat any day soon, but as a mode of transport to take you and three adults to your destination, this Peter Schreyer-designed car need not offer any apologies to anyone. Perhaps it’s not a car for drifting or even performing burnouts in a remote parking lot, but as a well-engineered and relatively-speaking stylish mode of transportation, this third-generation Rio blows the doors off its competition when the whole value-added package is examined. And not just inexpensive-this-should-appease-all-customers-value-added, either. There is an abundance of features – most standard – in this as tested at $21,895 sedan. And this model included a credible and intuitive navigation system with satellite radio, too. How many brand new off the lot cars with a list price of just shy of $22 grand can you name that have a heated leather steering wheel? The answer, to save you time and worry is none. Zero. Zilch. Nada. Bluetooth connectivity – and easy to set up into the bargain! Leather seats – front and back – again, on a $22,000 car – leather! A 1.6L Gasoline Direct Injection (GDI) 4-cylinder engine providing 138hp and 123 foot pounds of torque. All of the above and also a more than respectable EnerGuide/Government of Canada gas consumption rating of 6.8L/100 city, 4.9L/100km which to the non-metric among you translates into 42 mpg city and 58 mpg on the highway. With its sport-tuned suspension, 17” wheels and available 6-speed automatic transmission, good things do indeed, come in small packages. Soaking wet and weighing in at just over 2,400 pounds, this smart-looking, surprisingly spacious and quite respectable small sedan will not look out of place on many driveways. Some owners may even make a point of leaving their Rios on their driveways – just to show off a little. Laugh if you like, but you know it’s going to happen. Along with sister company Hyundai, Korean manufacturers are doing their bit to turn an often staid automotive industry on its ear. Even today, they are beating Japanese manufacturers at their own game by adding incredible and desired value-add all the way through their product lines. But can they produce stylish in-demand cars? Yes. 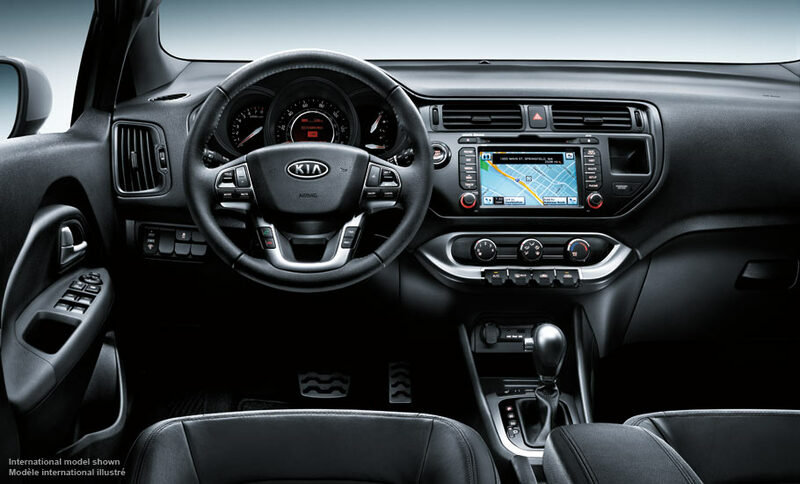 Interior of the 2013 Kia Rio SX sedan – surprised? Don’t be. Can they consistently engineer and build reliable vehicles. That’s how things seem – especially when you look at what may well be coming down the proverbial pike. The conclusion? Well, that will be up to consumers. From this person’s perspective, these days, there are now several very attractive 800lb gorillas in the room from this one manufacturer. And aren’t we all now just a little bit mad as hell? Perhaps. The next year or two will tell the complete story. Almost across the board, Asian manufacturers and designers can continue to hold their head a little higher. Based upon recent driving experiences, the more traditional Japanese car builders are upping their game, too. Will the North American Big Three respond? Let’s hope so. At the end of the day, it will strengthen the industry generally. And for the record, did no-one learn anything from the days of too many multiple marques and variations just a few short years ago?